KGcosmetics was founded in the summer of 2012 to create a makeup brand that besides offering a variety of makeup products also has focus on skin sensitive and allergy friendly products. All of our products are Paraben and Talc free. The KG exclusive palette has all the powder makeup products you need for any occasion. It is created and designed by celebrity makeup artist Katherine Graciano, to facilitate you and your makeup needs. After more than 20 years in the beauty industry working with mixing and blending both hair and makeup colors for numerous celebrities and VIP's, Katherine is now sharing her secrets, knowledge and experiences with the rest of the world. This unique palette offers 5 product groups, a total of 24 products that includes basic, fundamental and pang colors. The extensive product selection makes creating any look, for any skin color or tone, possible. The palette comes in an elegant black design in artificial leather, with a good size makeup mirror and a magnetic bottom, to keep your makeup in place. KGcosmetics focus on sensitive skin and allergy friendly ingredients, ALL our products are Paraben and Talc free and made in the US. The color combination in the palette is chosen carefully to cover both day & night makeup needs, and it makes it very easy to create many different, unique and fabulous looks. What colors to mix and play with depends on your taste and creativity, only your imagination sets the limits. This unique all-in-one makeup powder palette is very compact and with a size of only 9" x 7" it will easily fit in any handbag, and minimize the space usually used for all your makeup in the most practical way. The palette is also perfect for my fellow makeup artists. We're usually pressed for time, especially when working at bigger events with multiple clients. My palette simplifies the number of makeup powder products you need to bring, and it's a super, simple, organized and structured place to have all the products in one place. No more looking for that one blush you're not actually sure you brought in your travel size suitcase, everything you need is right there in the palette. I created the ultimate makeup powder tool kit for you, all you have to do is what you love, make yourself and/or your clients look fabulous, flawless and stunningly beautiful. The latest product from KGcosmetics is this amazing combination of bronzing & illuminating powder. 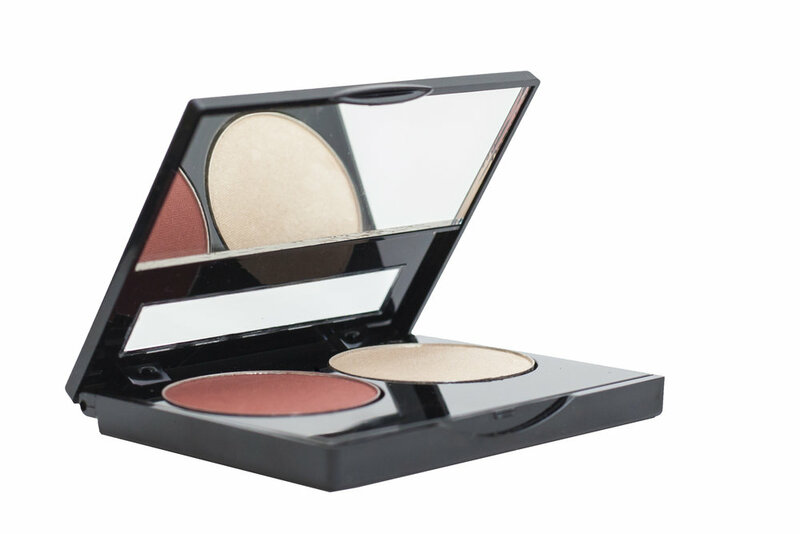 This compact duo easily fits in any purse and is going to give you a healthy sunkissed and highlighted look to your skin. The color duo is Cocoa & Golden Glow.